As an Expat' Brit I really do miss a nice bit of Crumpet! British crumpets aren't sold where I live and living without them wasn't an option so I went in search of a recipe. After taking the bits I liked (the easy bits) from a few recipes, I devised one that worked well. 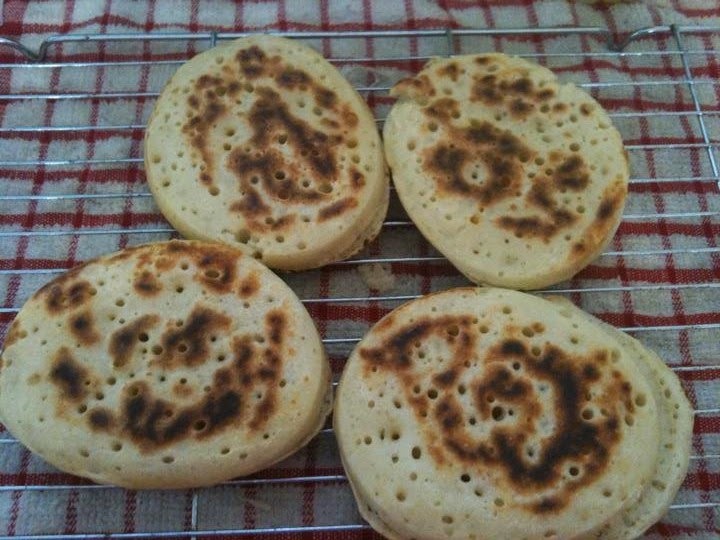 I often get asked for my Crumpet recipe so now I am sharing it. If you have egg rings like these, they are superb for crumpets. If not, you could cut the tops and bottoms of some tuna tins I suppose but that isn't one that I will be doing as a veggie! You could even use biscuit cutters - your imagination is the way to go on this one. Put all the dry ingredients into a bowl (I told you this was simple). Pour in the milk and the water to make a batter and beat it well. Set this aside for about an hour in a warm place. Stir the mixture well to get rid of the air trapped inside it. Grease a frying pan or a heavy bottomed pan (I love this term) and heat up the pan. Pour some mixture into the rings until they are about half full. It takes about 10 minutes to cook the crumpets. 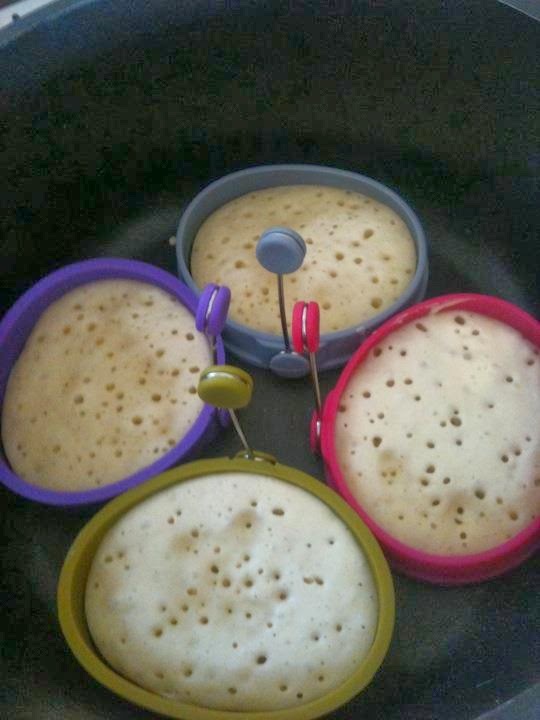 Once you have good holes and the mixture is almost solid you can flip the crumpets to toast their bottoms (or tops depending on how you define these). These crumpets are really simple to make but the key, as you see is to make them ahead of time due to the hour's waiting time in the middle of the method. The great news is that I have frozen crumpets that I have made from this recipe and they freeze brilliantly. They don't need defrosting and can be toasted or oven cooked from frozen. Oooh, I'm going to have to try these!